Evolving the world’s largest industrial wireless portfolio, Emerson announced today the adoption of advanced thermal energy harvesting as a power source for its wireless products. Power Puck® thermoelectric energy harvesters convert ambient heat commonly released in industrial processes into electricity for powering Rosemount™ wireless transmitters. Perpetua’s Power Puck energy harvesting solution is especially advantageous to wireless devices in power intensive applications, where a conventional power module may require replacements more frequently. 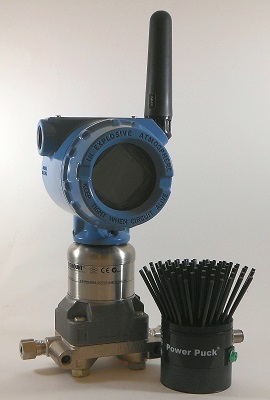 The company’s Power Puck thermoelectric energy harvester provides continuous, reliable power for the life of the transmitter and includes an intrinsically safe power module for back-up power. "Perpetua’s Power Puck is a convenient, sustainable energy harvesting solution which can be incorporated into a variety of applications, enabling users to decrease maintenance costs," said Bob Karschnia, Emerson’s vice-president and general manager for wireless. "We have been working directly with Emerson and their customers and are pleased with this expanded relationship and the vote of confidence in Perpetua products," said Jon Hofmeister, president of Perpetua Power. "We look forward to supporting Emerson’s mission of driving customer value through widespread adoption of industrial wireless technologies." A heat source is all that is required to fully power wireless transmitters at their fastest update rate using Perpetua’s Power Puck. Configurations allow connections to most heat sources, including flat and curved surfaces with temperatures up to 840°F/449°C. Power Puck solutions are intrinsically safe and classified for use in hazardous areas. Power Puck certifications include ATEX, IECEx, the US, and Canada.